EM100Pro-G2 is DediProg SPI NOR Flash emulator integrated high-speed DRAM memory to offer the best code updating performances. This advanced tool has been designed in close cooperation with the SPI NOR Flash suppliers to emulator the behavior of all the SPI NOR Flash on the market and also the next generation SPI NOR Flash. It provides engineers with a flexible development and testing tool for any embedded project that uses an external SPI NOR Flash. It provides quick, in-circuit firmware test cycles during development. 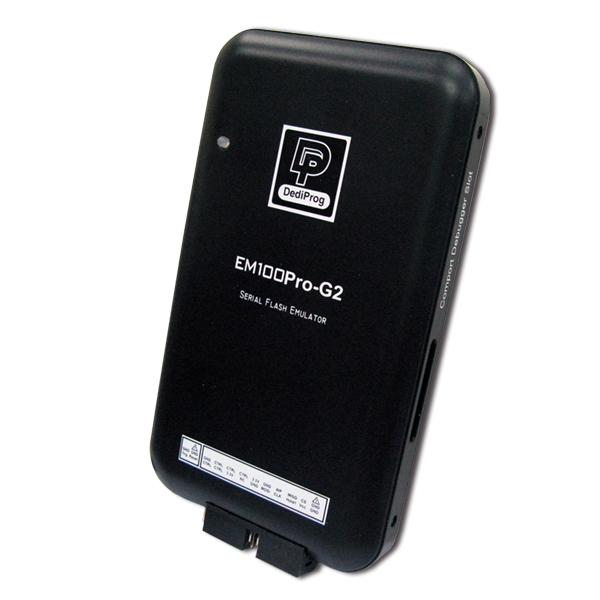 EM100Pro-G2 increases productivity by downloading firmware code or data into the emulator in a few seconds for density as large as 512Mb. In addition, it provides "SPI BUS Analyzer" feature by collecting all the SPI command and data on the SPI bus in order to help the debugging process. It will speed up your firmware development and testing by eliminating the need to remove-erase-program and re-install SPI flash each time you test a code change. If you want to stop the "program/insert/boot/remove/erase" cycle, then this is the tool for you. • EM100Pro-G2 can connect with Intel motherboard by specific adaptor ISP-ADP-Intel-C (Option). Click HERE for further information.